The oldest film on this list, Superman (1978) from Richard Donner is fondly and rightly remembered as the Godfather of comic book cinema. The tagline said it all, we finally believed a man could fly. Making a movie in the 70s with such believable effects should not be understated, though naturally it is hard to fully appreciate that when viewed through modern eyes. Much of the “wow” factor has been lost but this film still holds up extremely well, mostly due to strong performances from Christopher Reeve, Margot Kidder, Marlon Brando, and of course Gene Hackman as Lex Luthor. In a strange way, the effectiveness of certain scenes has morphed over time. It was phenomenally important for the medium and for our specific genre that the visuals and actions sequences work and so they may be the most important scenes in the movie from a meta perspective. But ironically, it is now the scenes with more standing, talking, and plotting that are most watchable. Clark Kent spending time in the fortress of solitude, or pretty much any scene where Hackman gets to deliver a monologue stand up with the very best of character drama seen in such films today. The film was technically advanced enough to be nominated for Best Film Editing, Best Music (Original Score), and Best Sound Mixing. It was so far ahead of its time, in fact, that it had to receive an honorary “Special Achievement” award for Visual Effects because such an award was not yet standard. Thanks to Superman, it would be eventually. Speaking of “Best Music,” this flick has arguably the greatest hero theme of all time. 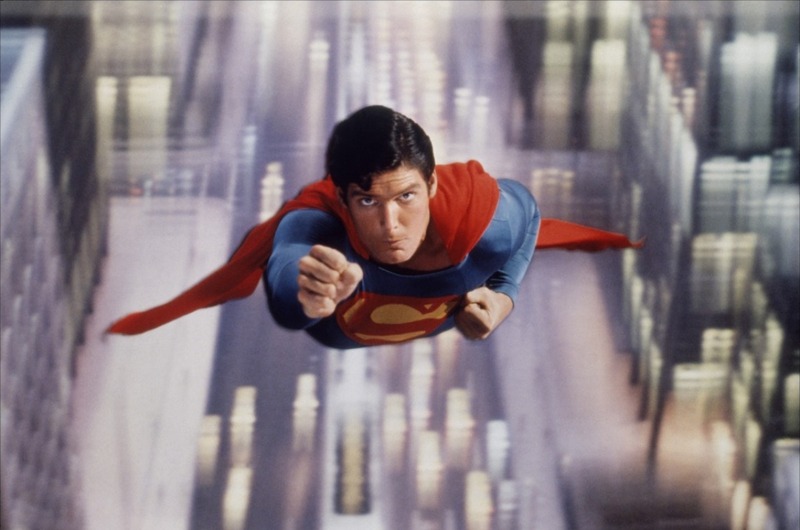 John Williams is no stranger to triumphant, driving themes and while Star Wars, Jurassic Park, and Indiana Jones deservedly are remembered as all-time great soundtracks, the titular theme from Superman may be the his single best work of them all. Either way, that’s one hell of a resume. Smartly directed and paced, Superman proved to the world that comic book movies and characters could be taken seriously in Hollywood. Prime Time actors like Hackman and Brando could be brought in for key roles, money and effort could be spent on the visuals in order to capture that magic found on the colored pages, and stories of flying aliens can be told with earnestness and heart. Christopher Reeve just oozes with charm for the entire film. Without a sociological study to back my claim, I contend his portrayal in this movie became the definitive one and took the character from an American hero to the symbol for truth and justice all over the world.